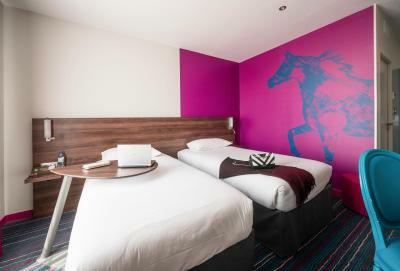 Lock in a great price for ibis Styles Saumur Gare Centre – rated 8.9 by recent guests! The staffs are very nice and they even help me find a taxi, and of course in French. Friendly, knowledgeable staff. Bright, clean rooms with confortable beds. Overnight stay in Saumur. Able to get motor bikes in to secure parking. Staff were really friendly and very helpful. Facilities were good. Rooms nice and spacious. Breakfast lounge and food were great. Location for the town was excellent. A model for short stay hotels in provincial France. Modern, stylish. 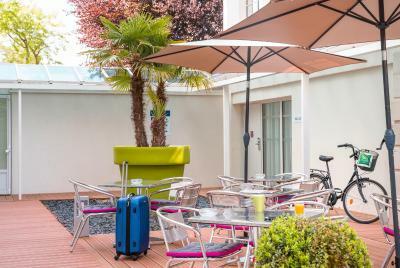 airconditioned, easy parking ( reserved, secured parking, if necessary), comfortable beds and a generous, FREE breakfast ( the kind for which other hotels charge a minimum of 14 euros). Wecoming staff and a short walk to a very good little bistrot ( Le Bouche a l'Oreille). Opposite the railway station ... but quiet nonetheless. Why can't all provincial hotels in France be this good? Clean and comfortable stay the night person great customer service. The hotel was very nice and modern. The room was comfortable and very clean. Breakfast was very nice - continental but with plenty of choice. There is safe free parking right outside the hotel. Great beds, good breakfast, staff very helpful and friendly. We reached there early morning at 4am and still we received a nice welcome and the beds were very comfortable. 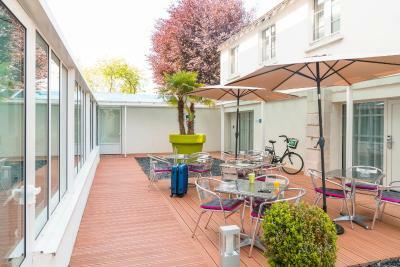 Set opposite Saumur Train Station, Ibis Styles Saumur Gare Center is a 10-minute walk from the city center, on the Loire River's right bank. 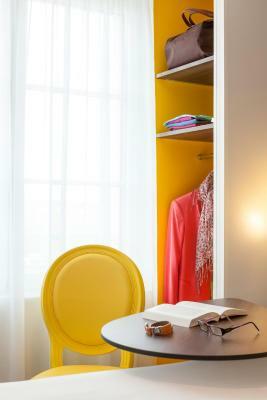 This design hotel features a garden, terrace, free Wi-Fi, and bikes can be rented on site. The soundproofed and air-conditioned rooms all have a flat-screen TV and a private bathroom with free toiletries. Most rooms also offer views of the castle, theater or Loire River. 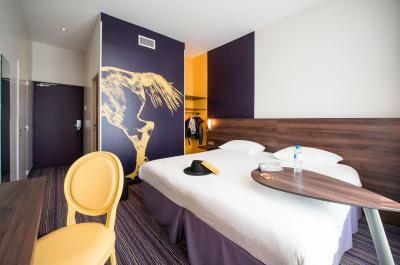 Ibis Styles Saumur Gare Center is only 1.2 mi from the Château de Saumur. There is a private parking, just 100 feet away from the hotel. Guests can also choose to visit the Abbey of Fontevraud, which is 9.3 mi away or the Bio Parc Zoo, which is 8.7 mi from the property. 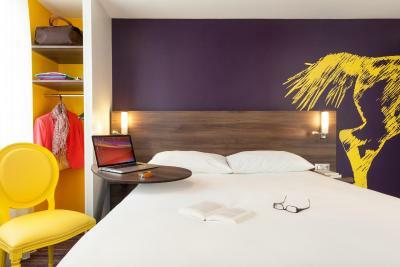 This is our guests' favorite part of Saumur, according to independent reviews. This property is also rated for the best value in Saumur! Guests are getting more for their money when compared to other properties in this city. 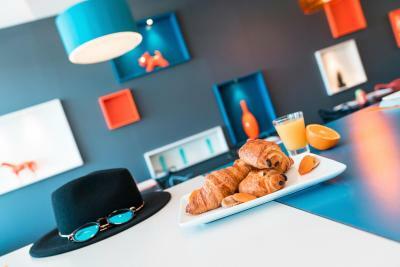 When would you like to stay at ibis Styles Saumur Gare Centre? 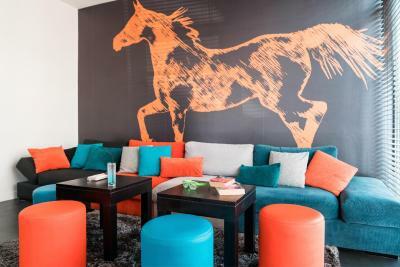 The soundproof and air-conditioned rooms have a flat-screen TV and a private bathroom with free toiletries. They also provide either a view of the city and its chateau, or a view of the patio. The soundproof and air-conditioned suite includes 2 connecting rooms. It features a flat-screen TV and private bathrooms with free toiletries. It also has a patio with views of the city. This suite is suitable for 2 adults and 2 children only. 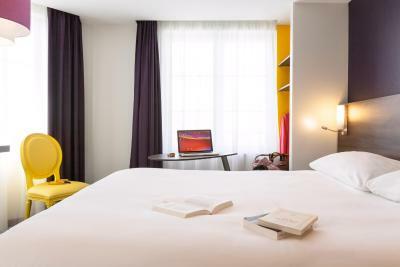 House Rules ibis Styles Saumur Gare Centre takes special requests – add in the next step! ibis Styles Saumur Gare Centre accepts these cards and reserves the right to temporarily hold an amount prior to arrival. Maybe have tea/coffee in the room. There were no eggs for breakfast and the choice was limited. Breakfast until 10am (would be nicer to have it until noon on lazy holiday mornings...). Hotel situated next to the train station is great for business, but it's a 15-20' stroll from the touristic part if you are there for holidays and expect to be in the heart of it (note that it was quiet though, we didn't hear any trains during our 3 day stay). Very clean and comfortable beds. Nice clean towels provided. The lift was a bit small for people with luggage. It's difficult to fit a full scale 10-person lift into an older building, no matter how skilled the architect, but this one was cramped. And the TV did not have much in the way of English news channels. Again, the demand for non-French TV is probably limited in this part of France, which is a little off the main tourist routes, but CNN and or BBC World would be easy to arrange. Great location, excellent facilities and very nice rooms. 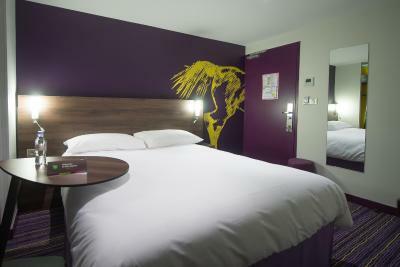 The sort of slightly idiosyncratic decor and that is the hallmark of Ibis Styles, but pleasant and relaxing. The room was clean, the air conditioning worked and the wifi was faultless. This review has been negatively impacted by the fact that the room was unbearably hot, making it very difficult to sleep. It was not possible to control the air conditioning. Quiet room with comfy beds and lovely white linen sheets. Great breakfast. Could’ve been a kettle in room? Not being able to sit with our friends at breakfast. View of the chateau and the river; large, comfortable bed; very quiet. We have been there before so we knew what to expect. There is a free car park approx. 2 minutes walk from the hotel which is very helpful.